I make a pizza just about every time I haven’t planned dinner. Among my many staples in the kitchen are pizza dough and some great cheeses. I always have plenty of pizza dough—a couple balls in the freezer, and one in the fridge. I just look around the pantry and the fridge for a few things that would be delicious on a crust, atop a bit of melted cheese. 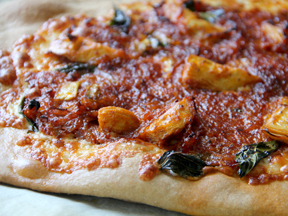 I don’t typically use a traditional tomato pizza sauce—rather, I cook the ingredients together in a way that they become the topping and the sauce. 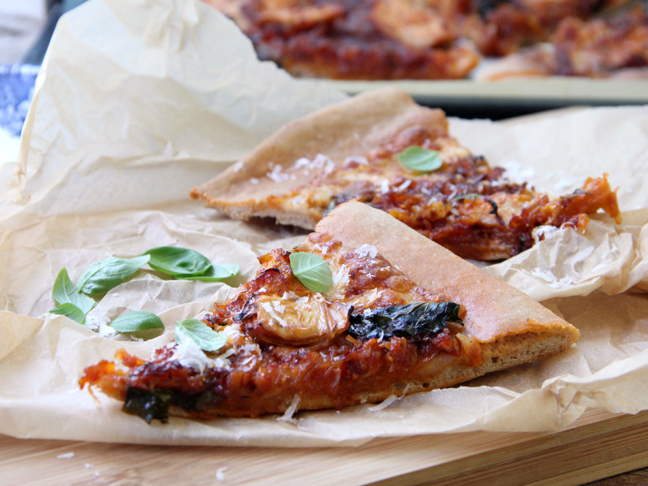 This caramelized onion and artichoke pizza is one of my favorites! Step 1: Add the clarified butter and the onions to a medium sauce pan, over high heat. 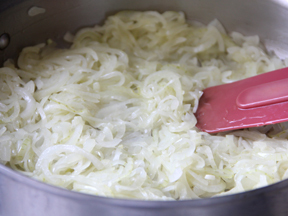 Step 2: During the first 15 minutes, stir the onions almost constantly. 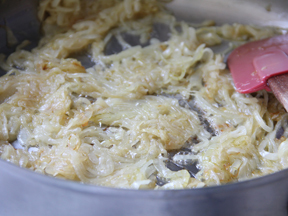 Once the onions are soft and beginning to brown, reduce the heat to low and stir periodically for at least another 15 minutes. When the onions are done, they will be very soft, golden brown, and super sweet. 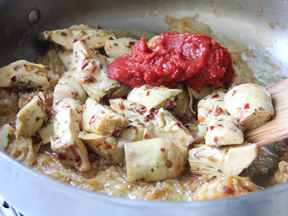 Step 3: Add the artichokes and tomato paste, stir to blend, and increase the heat to high. 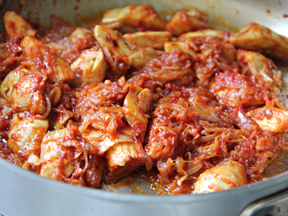 Cook for a few minutes, until the tomato paste has browned. Deglaze the pan with sherry and reduce completely. Season to taste with salt and pepper. 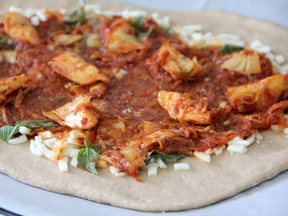 Step 4: While the onions are about 20 minutes away from being finished, heat the oven to 400 degrees and remove the pizza dough from the refrigerator. Cover a rimmed baking sheet with foil and coat with the olive oil. Step 5: Dredge pizza dough in the oil and leave it on the baking sheet. 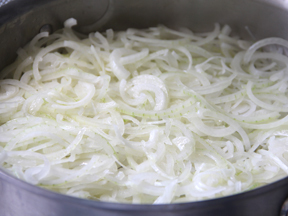 When the onion mixture is done, shape the dough by holding it up in the air and letting the bottom drop. Rotate your hands in a circular motion until a nice flat round begins to form. Try not to pull on the dough or it might tear---it won't be an exact circle, but rather an odd shaped one. Step 6: Place the dough on the baking sheet---it should cover most of the surface. 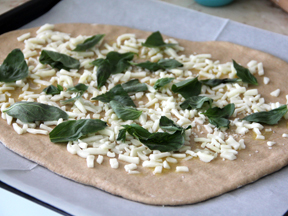 Sprinkle the dough with the gruyere and then layer the basil leaves on top. Step 7: Use a small, flat spatula to spread an even layer of the onion mixture on the basil. Step 8: Bake for about 15 minutes, until the crust begins to turn golden brown. 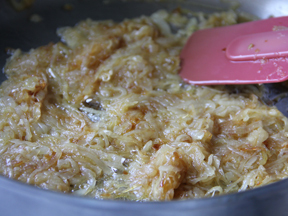 Caramelizing the onions is well worth the long process---the longer you cook them, the more intense and sweet they will be, and anything you add them to will become brilliant! *Trader Joe's has fantastic pizza dough in the refrigerator section of the store. Also, many pizzerias will sell their dough.